What we love and desire forms the space for what we know. And so James K. A. Smith reads Augustine’s key phrases in the Confessions. Smith writes: ““In some sense, love is a condition for knowledge” (Smith 7). I love in order to know. As humans we are oriented towards something. Thus, a teleological existence. Smith and Augustine call attention to Man’s “heart.” It is our subconscious orientation to the world (8). Our heart is always “longing” for something, some ultimate end. Before he can clinch his argument, Smith calls attention to the virtues. 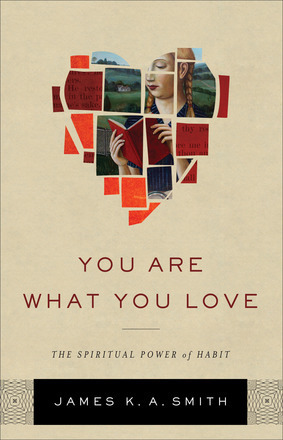 “They are character traits that become woven into who you are so that you are the kind of person who is inclined to be” x, y, z (16), “a disposition that inclines us to achieve the good for which we are made” (89). They are “thick realities tethered to particular communities governed by a particular Story” (159-160). And if our habits are often formed pre-consciously, then they need radical re-training, hence liturgy. Liturgy for Smith isn’t necessarily smells and bells (or even church-related at all). Rather, “a shorthand term for those rituals that are loaded with an ultimate Story about who we are and what we’re for” (46). A liturgy could be the Book of Common Prayer or it could be a trip to the shopping mall. Smith rarely misses an opportunity to attack “intellectualism,” but with the exception of Descartes, we aren’t sure exactly who is guilty of this. He says “new information doesn’t change a deformation” (83), but do we not see the converse in American universities, where the professor speaks of Marxism, Darwinism, and gender fluidity? Smith is a talented writer and it shows. While there is a lot of repetition from his earlier works, his argument is focused. His take on virtue is quite good and his model for pedagogy bears promise. In fact, as a teacher I had been using his take on pedagogy (in short, we are in loco parentis). Per ideas and their effects: Given your example about the universities, the question is whether those sorts of ideas change students who hear them, or whether coming from certain environments, or being immersed in them, makes their reception easier. With the exception of actual Marxism, Feminism and gender fluidity make sense in a society that has turned good and virtue into values and liquid price, thus a strange rise of the subjective and the belly. In that, gender fluidity already makes a lot of sense, why can’t people choose who they want to be, all the way down. I don’t think Smith gets it right, and I think the Augustine tradition has its limits in untangling this. And while I don’t dispute the power and effect of ideas, these ideas must materialize, become flesh if you will, if they are to make a lasting impact. I think this is rarer than the process of ideas mapping onto social realities already in place. The Hegelian dialectic as the mechanism of progress was based, primarily, on master-slave relations already existent in the Americas. Marx altered this theory to understand the conditions of the factory worker. The power of ideas emerges out of, and then offer the possibility of changes, out of materialized circumstances. The power of the Gospel would be nothing if Christ did not rise etc etc.